Just — as in ONLY — for a Change | Normative Signs: The Poetry of "Ought"
This sign is posted in a unisex washroom at Billy Bishop Toronto City Airport. It clearly forbids any deviant uses of the adjacent infant-changing table. But frankly, I have no idea what kinds of other uses it’s got in mind. I mean, what, have people been using it as a dining table? 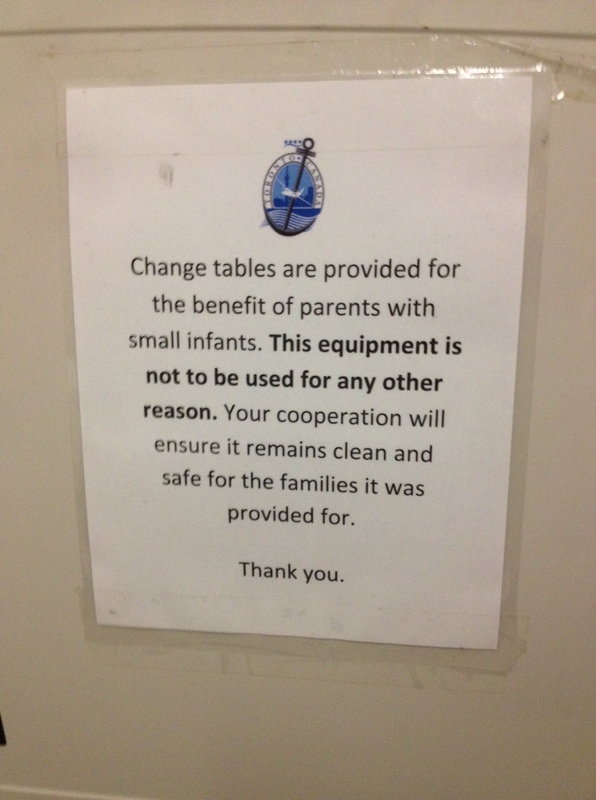 I would never have thought of using a changing table for something else — at least not until this sign suggested that there might be other uses. Notice the range of normative ‘tones,’ here. There’s an indication (in the first sentence) of what the table is intended for, which is one way of subtly discouraging deviant behaviour. Then there’s the firm injunction, in bold type. Then there’s the final nod towards the values of community and family.